Markhor is the national animal of Pakistan and its race is about to extinct due to the hunting. The heartless killing of rare national animal of Pakistan continues in Naya Pakistan and a number of foreigner hunters are paying millions of US dollar in order to hunt Markhor. The rare wild goat is found in the upper parts of the Neelum valley, apart from other northern areas including Gilgit-Baltistan, Chitral district, Valley Kalash and valley Hunza. According to the International Organization for Protection of Power and Natural Resources, International Union for Conservation of Nature (IUCN) Markhor is among those animals that are about to extinct and the number of adult Markhor is less than two thousand and five hundred. This wild animal has the four-foot long horns and is founded in Gilgit and Koh-Suleman. It likes to eat snakes. The name of Markhor is a little strange as the meaning of “Mar” in Persian is the snake and “Khor” which means “eater”. Well, it’s an animal like goat and cannot eat snakes but its association with snakes is may be due the similarity of his (curly) screwy horns. According to the local folk stories, Markhor kills the snake and chew, and the result of this foam like substance comes out from its mouth, which fells down and dry. People find this dry foam and use it in snake bite treatment. Markhor’s height ranges from 65 to 115 cm, length 132 to 186 cm and weight 32 to 110 kg. Its color is light brown to black at the bottom of the legs. The male markhor has more hair on the neck, chest and lower legs as compared to the female. On the other hand the female markhor has the reddish brown color of the body and the little hair on body and chin and does not have hair on neck. Both male and female have screwy horns, which are separated close to the head while moving towards the top. The horns of the male can be 160 cm and the horn of the substance up to 25 cm. The males have a pungent smell, which surpasses that of the domestic goat. 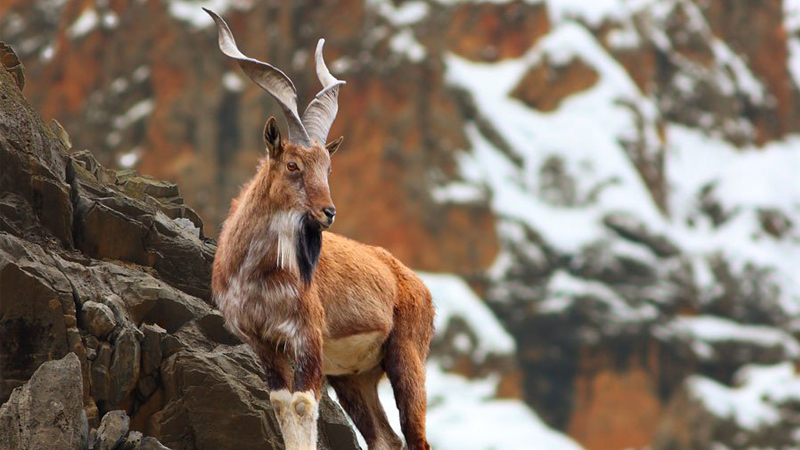 Markhor is mountainous animal and can be found on the height of 600 to 3600 meters. It is usually seen early in the morning or in the afternoon. Their diet changes with season. These eat grass in summer and spring while in winter they eat the leaves of the trees. Their voices are similar to goat. In winter, male and female are found in open grass fields together, while in summer the males remain in the wilderness and the female are mounted on rocky rocks. The pairing process is done in the winter and the male looks like trying to take a horn in each other’s horns. Female remain pregnant from 135 to 170 days and as a result bread one or two (sometimes three) lambs. Markhor live in the form of herds, which comprises up to 9 members. There are three types of Markhor including Astore Markhoor, Kashmiri Markhor and Pir Panjal Markhor. The population of Markhor is found in remote areas of Balochistan, Khyber Pakhtunkhwa and in Dera Ghazi Khan. According to the Forest Department of Khyber Pakhtunkhwa, their population is available in the areas of Mardan and Sheikh Badin. Pakistani parts of the White Koh (Karm and Khyber Agency) have at least 100 Markhors. During British rule, MArkhor was considered to be the victim of the hunting, because they were found in difficult paths and mountain region. Although their hunting in Afghanistan is illegal, they are traditionally victimized in the areas of Nuristan and Laghman and are expected to increase in the present Afghan war era. They are still hunting near the Pakistani border in India. In Tajikistan, Uzbekistan, and Turkmenistan, it is also done due to the hunting of Markhor, which is used in various dysfunctional drugs. Markkhor has also been used to keep in Texas’s private hunters. According to the International Organization for Protection of Power and Natural Resources, International Union for Conservation of Nature (IUCN) Markhor is among those animals that are about to extinct. If the proper measures do not take to protect them, then this generation can be rare forever. Their total number is between two thousand and five hundred in the open forest. Markhor has got the honor of being the national animal of Pakistan. Apart from this, Markhor is included in the 72 animals whose photographs are in the special schedules of the World Organization for Wildlife (WWF) issued in 1976. In Pakistan a number of foreigners especially the Americans are paying millions of dollars in order to hunt the national animal of the country in hilly areas. 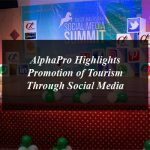 According to the Gilgit-Baltistan wildlife department, Bryan Kinsel Harlan, Dianda Christopher Anthony and John Amistoso. They paid more than 100,000 US dollars permit fee for the hunting of this animal in Gilgit-Baltistan. The brutal killing of rare wildlife animals continues in Naya Pakistan and according to a report so far above 50 endangered species have been killed. It is important for the local people now to raise voice to protect the animals instead of letting the foreigners to pay and kill them. The killings of rare spices have led to a drastic reduction in its numbers and someday its complete extinction.